James Elder was born July 27th, 1934 and started jumping competitively in 1950 at the age of 16 becoming the youngest rider to ever earn a berth on the Canadian Equestrian Team. For 50 years, Mr. Elder and his late wife, Marianne, operated Elderberry Hill Farm on Yonge Street in Aurora, Ontario, where they hosted the first grand prix jumping competition in North America in 1961. Mr. Elder’s accomplishments and contributions to equestrian sport are extensive and have brought world-wide recognition to the sport and Aurora over his competitive years. He was a member of the bronze-medal Canadian team in the 3-day event at the 1956 Olympics and of the winning 1959 Pan-American Games team. He formed a trio with James Day and Thomas Gayford that brought Canadian equestrians to fame in the late 1960s. Their show-jumping victories included two gold medals in Grand Prix at the 1968 Mexico City Olympics, the World Championships in 1970 and the Pan-American Games (1971). Two Pan-Am silver medals and two team Pan-Am bronze medals were also won in 1959, 1971, 1983 and 1975. Mr. Elder also represented Canada in the 1972, 1976 and 1984 Olympics, and participated with the winning equestrian teams at the Nation’s Cup in Rotterdam in 1980 and at the CSIO Nation’s Cup in Sydney, Australia in 1982. He was the individual international champion at the Royal Canadian Horse Show three times. Mr. Elder has also captured numerous other international classes and championships in Canada, the United States, Brazil, Columbia, Mexico, Venezuela, South Africa, Europe and Australia. In 1983 Mr. Elder was appointed an Officer of the Order of Canada and in 1985 he was honoured by the equestrian community for his longtime and outstanding contribution to Equestrian Sports. He was inducted into Canada’s Sports Hall of Fame in 1968 and subsequently in 2003 to Canada’s Walk of Fame. In 2012 he was awarded the Queen Elizabeth Diamond Jubilee Medal. 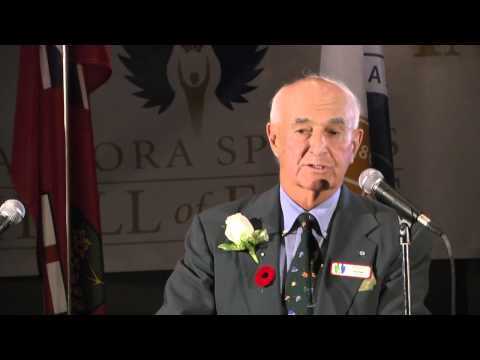 As someone who called Aurora his home for 50 years, and is recognized for his accomplishments in sport and as a member of this Community, the Aurora Sports Hall of Fame is proud to Induct him in our Inaugural class of 2013.